zCover Inc, pioneer and trend-setter in the fashionable silicone products market, has announced today the release of their Cassock Tough Fashionable Silicone Protective Case for Creative Vision M.
This Cassock Tough case features an enhanced all around protection with an reinforced silicone layer as crash cushion, which adds beauty to Zen Vision M as well as protect it if dropped. The hard crystal screen protector protects your Vision M screen from scratch. "It took us years to develop and perfect the mass production technology of multi-color silicone cases." said Sean Sa, Vice President of zCover Inc. "With 5 colors of Cassock Tough available, you will be able to change the look of your Vision M to match your mood, your fashion and your style while keeping your treasured device safe from scratches." Each zCover "Cassock Tough" retail pack contains one Tough case, a removable rotary Belt Clip and one hard crystal clear Screen Protector with soft rubber ring pad. In its first release of the Cassock Tough, zCover is offering a selection of five colors to the consumer. 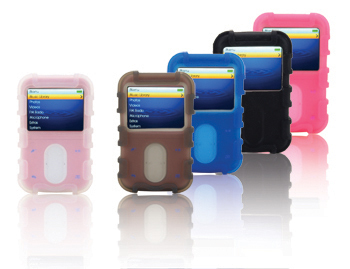 In this first release of Cassock Tough, zCover will feature silicone cases with living five colors. They are exclusively designed to give a splash of extra color and excitement, while providing durable protection. zCover Cassock Tough offers you a choice of five fun and bright colors: Tough Blue, Tough Pink, Tough Black, Tough Grey and Tough Ice Clear. Cassock Tough (retail packaging or on-line-order packaging) for the Vision M 30 GB contains one Cassock Tough silicone case, one hard crystal clear screen protector and one removable rotary Belt Clip.